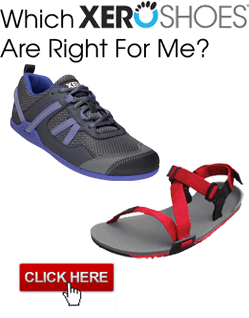 Xero Shoes® are a modern spin on the traditional barefoot running sandal — durable, stylish and affordable — and so light and low-profile it’s like you’re not wearing anything. Yet, you get a strong layer of protection, your feet and legs work the way nature intended, your posture can naturally realign, and you awaken your senses and stimulate your brain as you Feel The World™. Thanks to Chris McDougall’s inspiring and exciting best-selling book, Born to Run, and research from Harvard’s Daniel Lieberman, people all around the world are re-discovering the magic of barefoot running and natural movement. Many people describe how barefoot running has improved their running, healed old injuries, strengthened their feet and legs, turned flat feet into feet with arches, and much more. One big worry about barefoot running, not surprisingly, is all the stuff on the ground that can hurt and cut your feet, plus all the dirt you have to wash off when you’re finished running. And most stores and restaurants won’t let you in without shoes. That’s why you’ll want a pair of Xero Shoes. If you can’t or don’t want to be totally barefoot, these are “better than barefoot”. In his book, Chris McDougall describes huaraches, the running sandals of the Tarahumara Indians: a strip of rubber from an old tire and some string or lace to hold it on. Xero Shoes are a hi-tech update of huaraches. They’re lightweight — 3.4 ounces in a men’s size 9 — comfortable and flexible. If you like the feeling of being barefoot, you’ll love wearing Xero Shoes. Award Winning! Xero Shoes won the Grovie Award for Best Huaraches Running Sandal. The Running Clinic gave Xero Shoes the highest rating for barefoot footwear — a 94/100. 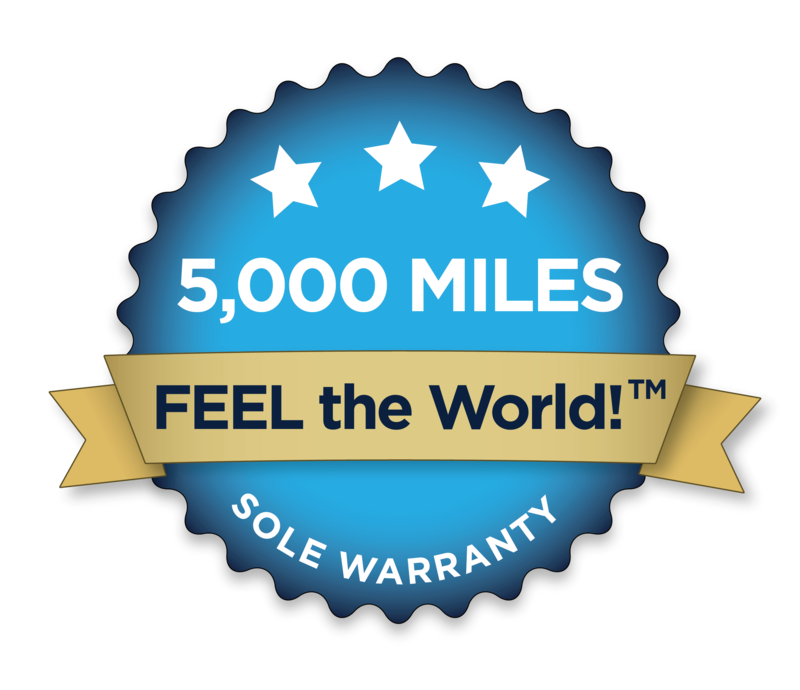 Backed by our 5,000 Mile Sole Warranty. People ask us “How long will these last?” And, frankly, we have no idea! So far nobody has outworn the soles of their Xero Shoes. But if you wear yours down to thinner than 1mm in under 5,000 miles, simply return them to us and we’ll replace them for just the cost of shipping and handling (more details). Compare this to regular running shoes that tell you to replace them every 300-500 miles. You could save thousands by wearing Xero Shoes. And then compare Xero Shoes to other “barefoot” shoes, where these are clearly closer to barefoot and at a fraction of the cost. For everyone and every thing. Over 25,000 people, ages 1-91, in over 87 countries use Xero Shoes for everything from walking, to hiking, to working out, to hitting the beach, running, and even tackling 100-mile ultramarathons. They’re perfect for tossing in your backpack for camping. Made for being barefoot. Our huaraches sandals are made with either our exclusive FeelTrue® rubber or 4mm Vibram Cherry sole material. The FeelTrue® outsoles are the only rubber outsole made specifically for barefoot sandals, co-developed with 2 former lead designers from Nike and Reebok. You can get either the 4mm Connect, for the closest thing to a barefoot feel, or the 6mm Contact if you want a bit more protection or a “smoother” ride. Get a perfect fit. Unlike flip-flops, or even most shoes, Xero Shoes are made to fit YOUR foot, no matter what size you wear or what shape your foot is. Wide, narrow, curved, or straight… short toes or long toes, your Xero Shoes are made for you. You can have fun with an easy and fun DIY (do-it-yourself) huarache project by getting an Xero Shoe Kit, or you can have us Custom-make Xero Shoes for you for only a bit more. The Xero Shoe Kit comes with complete instructions (which, actually, you’ll find here) for making your own hi-tech huaraches. Express yourself with your Xero Shoes. First, pick one of 9 colors of our nylon/polypropylene laces. These laces are strong, soft, don’t stretch, have no edges to dig into your feet, are waterproof, colorfast and, maybe best of all, look really cool. Plus, they keep your cost down. Then, pick a lacing style — from traditional to fashion-forward. See some examples are here. Finally, if you like, you can personalize your Xero Shoes and make them your very own with our pendants, charms and beads. Support the Tarahumara (Rarámuri) — When you buy Custom Xero Shoes we donate 10% of the price to The Tarahumara Childrens Hospital Fund (TCHF) to support the indigenous people of the Copper Canyon. We ship Xero Shoes and kits all around the world. Your actual shipping cost is calculated and shown during the checkout process. Ordering online is 100% safe and secure. Seems like this could be a much more enviro-friendly product if the soles were made out of used car tires. But otherwise, it is probably a much better shoe for the body being as it would simulate a more natural walking experience. One problem with tires is that they’re stiff and heavy and there’s almost no way for someone without tools to cut them (there’s no way to sell kits, that is). Many tires also have chemicals that can leach into your skin. One way that Xeros are environmentally friendly is that they’re made to last a LOOOONG time, and they use very little material. how about out of old bike inner tubes? Bike inner tubes have the opposite problem… to thin, to flexible, not abrasion resistant enough. If you make a pair of huaraches with them, you’ll rip through them within a few steps. I was wondering, would you say Xeroshoes helps avoid ankle rolls? I mean by putting your front foot down first, with the weight going down first on the front where there is more surface area and more “feeling” capacity, would that avoid ankle rolls?, which I imagine are caused by weight going down on the ankle part (the back) where theres less contact surface, and more chances for being destabalised and rolling. do you have any feedback about that, or do you have any info? Well, there haven’t been any studies, so I can’t give a substantiated YES… but a totally agree with your logic. When you heel strike, you don’t have any support for your ankle. But when you forefoot or midfoot strike, the muscles supporting your ankle are typically already engaged. Here’s another bit of logic that agrees with your idea: If you have a shoe with a sole that’s stiff laterally (if you can’t easily curl the outside edges towards each other), then if you land on an outside edge on a pointy surface (think: hiking and stepping on a rock just underneath your big toe), the stiff sole will pivot on that point, twisting your ankle. Conversely, if you’re barefoot or in Xeros, your foot will “wrap” around the point (or jump off of it!) and your ankle isn’t compromised. I got my own pair of Xeros just now so will be experimenting, and if I do get an ankle roll i will report back! its amazing to think there are advantages to expose our feet to what first seem to be discomforts! just found your site – I’ve had surgery on several of the tendons that have just blown up from my ankles rolling – and was just diagnosed with drop foot, and the peroneal nerve/tendon all the way to L5 being compromised. I had been given Born To Run, and since I was stuck in a chair not putting any weight on my leg, I read it…grabbed an old pair of swim socks, and started using them around the property, barefoot inside. Foot drop is gone – pain is gone, shin splints are gone – three weeks. And! this 100 pound overweight woman, with hip and knee and ankle problems has been running – just a little – 50 feet a at a time…but, I’M RUNNING! Now – to find shoes to replace those old swim socks! So, most everyone has given up because of that sham of a suit against vibram – but, I’m glad to find you. my foot is almost as wide as it is long, and I’ve never been able to wear a pair of flip flops with the toe thing…what can be done about me? First, CONGRATS on your achievement, Christine! Secondly, width isn’t a problem with Xero Shoes. Our ready-to-wear/ready-to-play Cloud and Venture fit most people. But for the rare few that don’t fit those, you can always get a perfect fit with our DIY kits. This knot on the “shoe” mentioned during Shark Tank, is a probably for anyone who wears these barefoot shoes? I love wearing barely-there shoes, so I think I’d like to try them. I’m only concerned about the comfort around this knot area. You don’t feel the knot — it’s pretty flat, between your toes, and covered in rubber. AND there are tying styles that have no knot. AND since the lace goes all the way around your foot, you don’t put pressure on the knot area. I am concerned about the knot. Is it on the bottom of the shoe? If so won’t it wear out the lacing? The Tarahumara had old tire type that had a groove to hide the know. The knot rarely, if ever, wears out. It’s pretty flat, it’s between your toes, and the rubber bends around it a bit. I’ve been wanting to order a pair of Feeltrue but first I have a few questions. Also, I’m a triathlete so how easy s it to put the shoe on and off? I know it depends on the lacing so are there any quick tie methods? First, I just made a video about putting these on/off — https://xeroshoes.com/barefoot-sandal-tying/barefoot-sandals-triathalons-and-speed/ — it takes less than a second for each. Secondly, no, huaraches aren’t “glued” to your feet. And the answers to both “does the toe string press on your foot” and how to run downhill are the same: Faster turnover without overstriding. In other words, the problem most people have with downhill running — regardless of their footwear or lack thereof — is that they tend to overstride and apply braking force to slow themselves down, rather than using their turnover speed for that purpose. I have issues with plantar fasciitis when I use barefoot shoes…how many reports of bruised heel have you gotten from users of this shoe who go running 5+ miles at a time? Thanks! Typically, barefoot or *actual* barefoot-style shoes (and Xeros are really the only thing I would say are close enough to being barefoot for this conversation) are used as a treatment for PF. Why? Because they inspire you to NOT land on your heel, but to land with a more mid-foot or flat-footed landing, which puts your PF in a stronger position when your foot touches down. If you heel-strike, you’re PF are stretched when your whole foot finally contacts the ground, putting them under excessive stress. And, no, we don’t have reports of heel bruises, even from our ultramarathon runners… again, because bruising can only come from landing hard on your heel which, hopefully, you’ll stop doing when barefoot or in footwear that really lets you feel the effect of doing so. Steven thanks for an awesome product I got the link from Al Kavadlo’s website. If people think the Xero shoe isn’t manly look at Al doing his amazing stuff with his body.I’m glad you are donating profits also Xero seems like a stand up company so far and I am planning on ordering a pair to New Hampshire when my tax check comes next week. Great product great people thanks so much! Just wanted to say thank you for the great work! Last year I made the transition to minimal running, starting with the famous Vibram FiveFingers. After having done the transition and increasing the amount of training again for some months, already the first cracks occured at the upper side of both shoes. I was totally disappointed, as I payed more than $ 130 for a pair of shoes that should simulate the behaviour of having no shoes. There should be something wrong about that, shouldn’t it, I thought. But then I accidentally discovered Xero Shoes and as I saw that they should deliver the same functionality for only a fraction of the price of other minimal shoes like Luna Sandals or Vibram FiveFingers, even with a 500 mile warranty I absolutely had to give them a try. Also that you spend 10 % of the price of every pair of Custom Xero Shoes to the Tarahumara Childrens Hospital Fund really is a good thing and shows that profit maximization is clearly not the companies single goal. So now some time after ordering my first Xero Shoes I am even more excited and I would never switch back to any other kind of shoes when it comes to running under most conditions. So please continue the great work and dont’t let yourself get discouraged by other people that just want to earn as much money as possible with something they not even invented themselves and that will never get the idea behind minimal running! Greetings from Germany! PS: Unfortunately here in Germany we currently have to order your shoes from the UK (with shipping costs). It would be really nice to have some kind of direct distribution, as I think there are already a lot of people interested in Germany (and probably other European Countries) in trying out minimal running shoes, but it is really hard to get those here (even Vibrams which are by far the most famous ones). But I understand that your company is currently too small to maintain a direct distribution in too many countries. The problem also is that most people in Europe just don’t know about your great products and will consequently probably never catch the idea to try them out, which really is a pity. WOW… thanks so much, Jonas! We’re currently (as of March 2014) in talks with German and other dealers in Europe… keep an eye on http://www.xeroshoes.com/stores. a) We just use a good pair of scissors for cutting. Though if you had something stronger, like tin snips, that would obviously be easier. Then we use sandpaper or a belt sander to make the edges perfect (though I can come pretty close with just scissors, since I’ve been doing this a while 😉 ). b) I don’t know how to answer your question about the toe post… how does cutting the material affect the toe post? c) You’re the first I know of who’s wanted to make tabi-style Xeros… good luck and keep us posted. d) How do you want to customize the Cloud? Shape? Lace colors? Something else? Has anyone asked about problems with sweating on the soles of the feet? Do they even get sweaty and slippery? I ask because I have no idea and I really want to try running in your sandals; I just kind of expect friction issues. How breathable/wicking can rubber be? And the whole idea behind barefoot running is that you don’t apply extra horizontal force on the ground, so you don’t get friction issues either (if you did, there wouldn’t be people running ultramarathons in Xero Shoes, which they do). do you notice much “breaking in” going from five fingers to huaraches? It depends on how your form is in the VFFs. If it’s good, then your transition should be smooth and easy. If not, it’ll take as much time as it takes (each person is different) as you experience having more feedback from the ground and more freedom in your feet.